We've been back from vacation for weeks, and it's taken me FOREVER to get through just a few posts. I am so sorry for the delay, but things have been hectic around here lately. And to make it worse, I haven't even unpacked my suitcase yet. How embarrassing! Now let's see, where did we last leave off? Oh ya, Yellowstone. We packed up our tent and headed for beautiful Grand Teton National Park. I had never been, but I knew it must be good if it was Dean's favorite place! By the time we did a bit more exploring in Yelllowstone on the way, it was later in the afternoon when we got to the Tetons. We set up our tent for the umpteenth time and then went for a short bike ride (okay, really short) to the Jackson Lake right behind out little campsite. I can't ride for long because it really hurts my booty. I just think it needs to be conditioned though. Some day I'll be able to ride longer with the captain, as long as it's not up a mountain. He's crazy! After our little trek around the campsite and playing a little nickle knock (I kicked his booty! ), we decided to have a meal cooked for us and headed to one of the restaurants in Coulter Bay. If my memory serves me correctly, we had the trout and the captain had buffalo meatloaf. Of course we couldn't finish dinner without a gorpy, over the top mud pie! Boy was it good. I almost wanted to lick the plate, but I didn't. On the walk back from dinner, we saw one of the most beautiful sunsets I could remember. It was stunning and the perfect way to end our first evening in the Tetons. that's right - I won! When we woke up the next day, the captain wasn't feel too well - he was coming down with a bug! Poor guy. Nevertheless, we decided to adventure out to Jackson Hole since a storm was going to blow in and potentially bring some sprinkles. Camping and the rain don't mix! That wasn't before we took a short hike around Lake Jackson. It was nice to feel the wind in our hair. Literally. The winds decided to really pick up and while the captain was taking some photos, his hat flew off and hit me in the face. Ouch! Talk about windy. He got an amazing shot of me though. I should frame this one for him. After an hour of exploration, it was off to Jackson Hole. It was only a short drive away and good thing we decided to do that, because it started to sprinkle shortly after we left camp. Yikes! And what better to do when it rains - have lunch in a teepee! I don't know why I was so excited, but I was. A little too excited considering I forgot to take a picture. Oops. Next time. A buffalo burger and a mug of hot cocoa and this girl was in heaven! Once we got to Jackson Hole, I knew I had to get a picture under these huge antler archway things. They were everywhere! It must have been the "Jackson Hole thing to do" since everyone else was doing it. I didn't know when we'd be back, so we had to too! We strolled around the town for awhile doing some window shopping and I eyed this chocolate place out of the corner of my eye called Cocolove. I don't know what it was about it, but I knew we had to go. Plus, we needed something chocolaty to warm us up on that chilly afternoon. I don't recall exactly what we had, other than it was small, chocolaty and had a hint of huckleberry. Who knew the place was run by one of the top pastry chefs in the world? I sure didn't. Only in Jackson Hole. On our way home, we decided to go moose hunting, but we didn't have much luck. Darn it. I really wanted to see a moose! After a long day, we finally got back to camp, tired and hungry and guess what? All of our camping gear was gone! GONE! Our tent was there, but we had a lovely note saying that we were out of compliance and not being "bear aware". Darn it! We didn't have anything out that a bear would want. Unless they like paper towels and silverware. After finding a single bar of reception and getting in touch with the ranger, they took us to where our stuff was and luckily, no fine. Apparently they can be up to $100! Phew. It was a long night and by the time we got our stuff back it was almost 9:30 before we had dinner. Nothing like a chicken enchilada backpacker meal to warm you up on a wet 35 degree night. Before we knew it, our bellies were full and we were piled under 100 blankets to keep us warm. Maybe that was just me. Ya, it was just me. I must have had at least six blankets in addition to the sleeping bag. It was chilly! The next morning we were headed on our trek back to California. 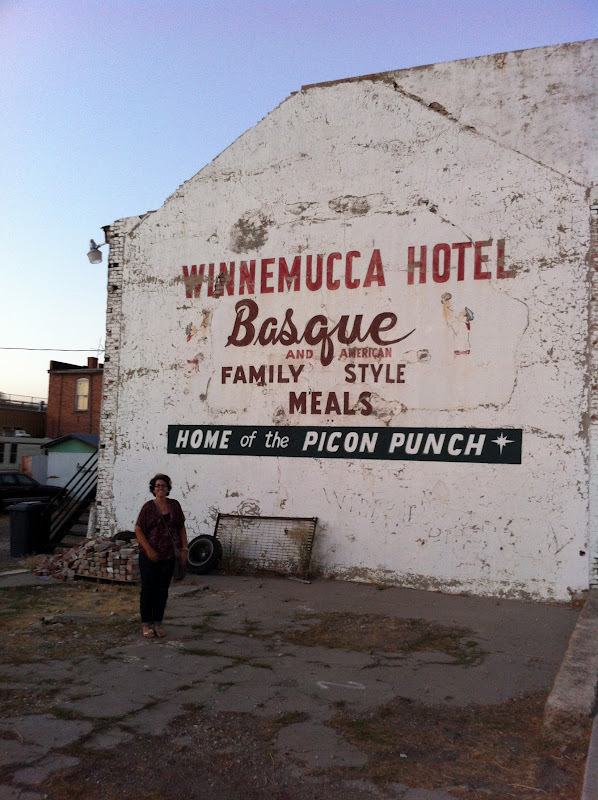 We packed up our stuff, folded up the tent for the last time and hit the road for beautiful Winnemucca, Nevada. Can you sense my sarcasm? It was about a ten hour drive from the Tetons and because the captain wasn't feeling well, I tried to drive as much as I could so he could rest. Has anyone ever told you how boring Nevada really is? Well let me tell you. It's boring. Flat, open and boring. Oh, I forgot to tell you the most important part - WE SAW A MOOSE! On the way out of the Tetons, everyone was out of the side of the road looking at buffalo, but the captain saw something waaaay out there. With a pair of binoculars, we could see it. What a special way to say goodbye to the Tetons. Thank you moosey moose! As the trip was coming to and end, we made our way to Winnemucca for a hot shower and a real bed for the night. Trust me, it's not anything special there. You're not missing much. But, we did find a pretty good Mexican restaurant among the old and strange casinos. The hot salsa is enough to cure even the worst of colds! The next day, we hit the road home on our final leg and made a quick stop in Reno to take a look at the planes in town for the Reno Air Races. A last minute decision took us to Lake Tahoe for and extended route home. It was absolutely beautiful in Tahoe and the perfect way to end our amazing two week adventure. The cold I caught from the captain when we got home was not. proof we made it to Winnemucca! My Ryan in front of a Ryan. I couldn't have asked for a better vacation or a more amazing person to share it with. We drove 2600 miles, used 150 gallons of gas and through everything, manged to survive it all with one another. If that's not true love, then I don't know what is. Well, true love with a few hangries thrown in the mix.